The lease retention program was designed to roll existing Maserati users into new vehicles when their current term came to maturity. It would also serve to help the dealerships better manage the lease maturities and a more streamlined system that would replace their existing legacy enterprise software. 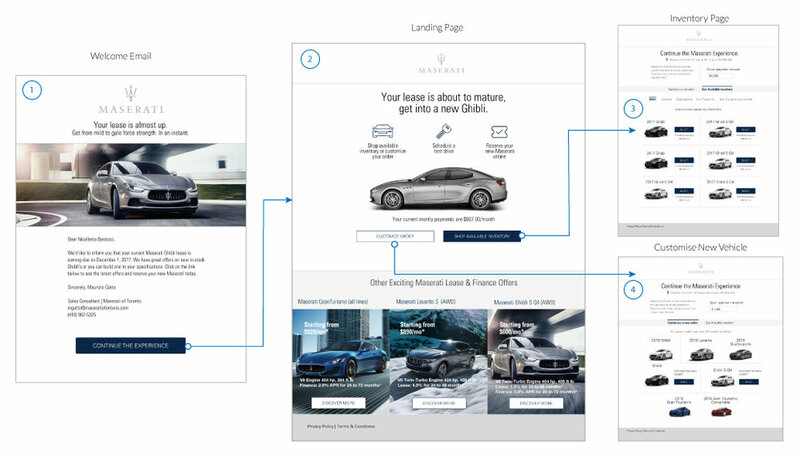 2 - A personalised landing page reminds the user of their monthly payments, and options to find available inventory with simillar payments, or the option to customise a new vehicle. 3 - Taking the user’s monthly payments, and vehicle model as a baseline, the system matches the criteria to simillar vehicles from the existing inventory. 4 -Users also have the option to customise a new build. 5 - Customising an order would take users through the Maserati build + price. 6 - At the end of the build and price the appointment step would be the trigger to create the order for dealers in their system. An alert would be sent to the dealer’s admin portal notifying them of the user’s action. A completed order generates the user’s ‘dashboard’ where they could schedule a test drive schedule another appointment or leave a deposit that would secure the inventory and act as a downpayment on their new vehicle. The dealer’s view is the other major portion of the motocommerce experience. The portal gives sales people and admins the ability to manage all upcoming leases, and incoming new orders. It also gave the head office users a view into the performance of all dealerships across the nation. The dealer dashboard informed sales reps of upcoming leases, and would allow them to send invitations to those existing users. 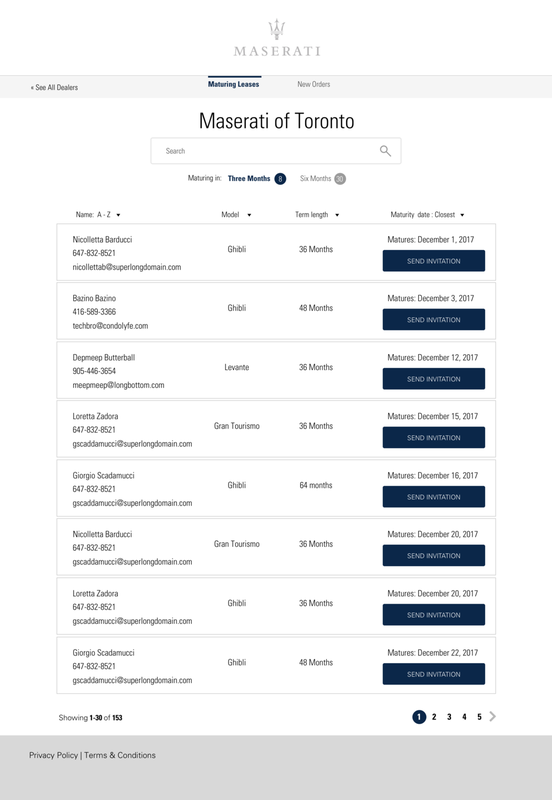 The portal’s new order view would also inform sales reps, on the status of each new order and highlight orders that required a sale’s rep’s attention. 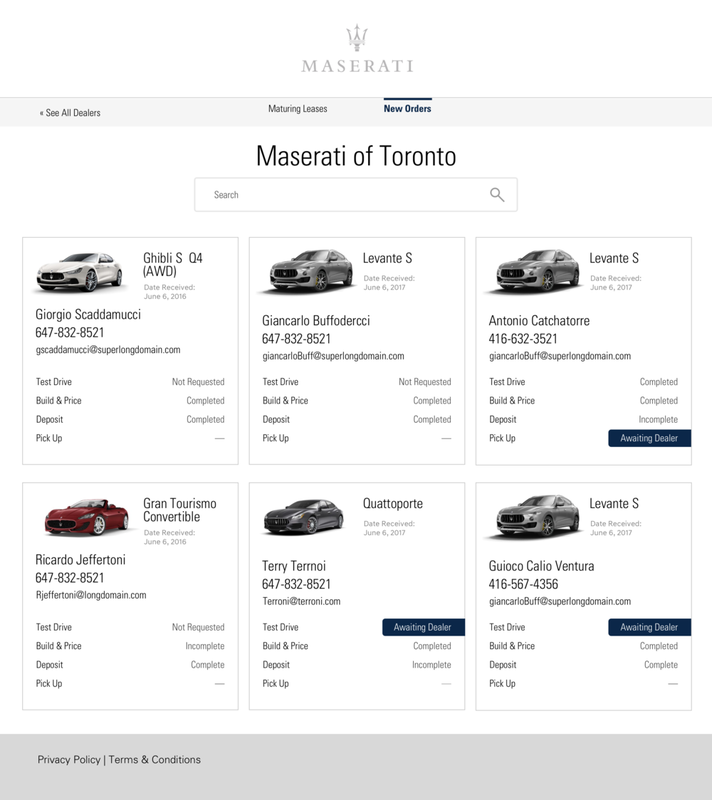 The Maserati lease retention program would go on to be the foundation for a new version of Motocommerce and would go on to be sold to other interested manufacturers, including Nissan and Audi USA.